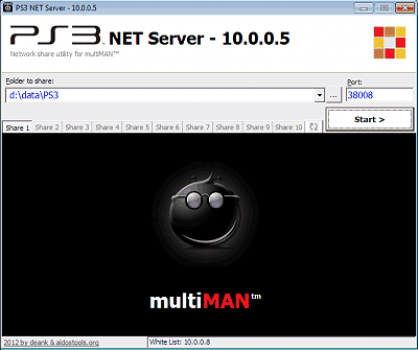 ps3 net server gui » Brewology - PS3 PSP WII XBOX - Homebrew News, Saved Games, Downloads, and More! aldostools has updated 3 of his previously released tools as well as added 3 new ones. It’s a tool that verifies, pack and unpack multiMAN’s theme files (THM). Changes: – Version 1.3 includes a verification template and auto-complete for paths. – Version 1.2 fixed a critical error in the mmTM_GUI that was creating corrupted THM files. TXT to Links.xml 1.0 new! PS3 NET Server GUI 1.0 updated! It’s an improved GUI for the PS3 NET Server (the PC side of multiMAN). It’s a tool to edit PARAM.SFO files and the PARAM.SFX files created by “Create PS3_EXTRA” (see below). This tool scans for the PKG, MP4 and P3T files copied to each game folder, its PS3_UPDATE folder, PKGDIR or PS3_CONTENT, and store them under a PS3_EXTRA structure. It scans for the PKG, MP4 and P3T files copied to each game folder or its PS3_UPDATE folder, and store them under a PS3_EXTRA structure. When a game is mounted with multiMAN, there will be 2 BD icons on the XMB: one disc for the game itself and another with PKGs, MP4 and P3T. It should make it easier to install the game patches, DLC, fixes, and related videos. It’s a tool that should help you gain some space on your external HDD, removing unnecessary files. This tool, if copied to the GAMES or GAMEZ folder, will rename the games sub-folders from the default “BLUS0000-[Title]” format to “Title [BLUS0000]“. Download the files or find out more here.